Few UH faculty members are as immersed in student life as Dr. Michael A. Olivas and Dr. Augustina “Tina” Reyes (Ed.D. ’91): not only are they both professors, but they live in an apartment on campus in the Calhoun Lofts. “It’s always wonderful to get on the elevator in September and meet all the new students,” Reyes mused. “We should have done it years ago,” added Olivas — and not just because the commute can’t be beat. “There’s nothing like being around students — both of us are around them in classes, of course, but it’s different when you live in the same building.” He has found himself offering advice to graduates applying to law school; Reyes even hired a math major who scanned IDs at the front desk to work for her on a research project. 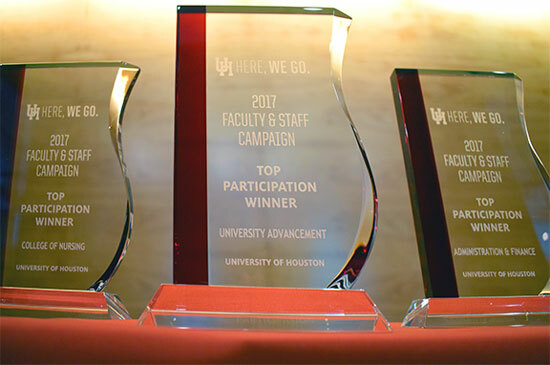 Not all employees at the University of Houston have the chance to interact with students every day, but UH’s faculty and staff have risen to the challenge set by Olivas and Reyes — who are Co-Chairs of the 2017 Faculty & Staff Campaign — to raise $100,000 for UH priorities, which include scholarships and faculty support. Faculty and staff support is a vital part of university fundraising, and the focus of the 2017 Faculty & Staff Campaign was to maximize participation, no matter the size of the gift. Ultimately, 25.2 percent of all of UH’s 5,604 faculty and staff participated, and together, they raised $1,344,191 for the Faculty & Staff Campaign. Each college and unit was ranked by participation — not amount raised — in three categories, depending on the number of employees: the College of Nursing placed first of those with fewer than 100 (with 100 percent participation! ), University Advancement took home the prize for 101-200, and the Division of Administration and Finance had the highest participation rate for departments with more than 200 employees. Philanthropy has always been important to Olivas and Reyes — whether they are receiving or making the gift. “Education has been transformative for both of us, and we’ve both been the beneficiaries of many scholarships throughout our academic careers,” Olivas said. “Giving back is a natural thing, because at some point, someone did that for us.” They both drew inspiration and support from their parents, as well; Reyes was the first in her family to attend university. Olivas’ father was in the military and then worked as a store clerk while earning his accounting degree. “He would do his homework at the kitchen table, and we’d sometimes find him asleep there when we woke up in the morning. As a result, we always understood the importance of education,” Olivas said. 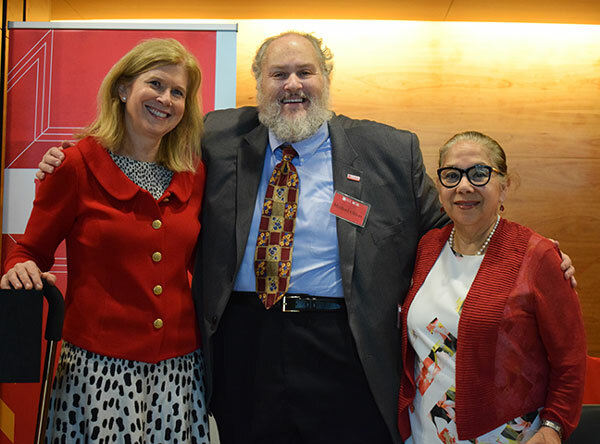 The Faculty & Staff Campaign will be an annual tradition for UH, and if this year’s leadership from the Co-Chairs is any indication, the support they provide will fuel Houston’s university for generations to come. Attention UH faculty and staff! If you didn’t make your gift, yet, it’s not too late. The “Here, We Go” Campaign is still going strong, and we will continue to track Faculty & Staff participation rates through the end of the fiscal year (August 31, 2017). For more information about the Faculty & Staff Campaign, visit https://giveto.uh.edu/get-involved/faculty-staff/. To see more photos from the 2017 Faculty & Staff Campaign Celebration, visit UH Philanthropy on Facebook.